To Cite: Lotfali E, Shahverdi A R, Mohammadi R, Noorbakhsh F, Ghajari A, et al. In Vitro Activity of Two Nanoparticles on Clinical Isolates of Candida parapsilosis, Showing Resistance Against Antifungal Agents in Children, Arch Clin Infect Dis. 2017 ; 12(4):e13853. doi: 10.5812/archcid.13853. Background: Resistance of pathogenic fungi to conventionally available antifungal agents has been increasing and has become a serious problem. On the other hand, nanoscience has emerged as a powerful tool capable of developing and designing new antimicrobial drugs. Objectives: The aim of this study was to test minimum inhibitory concentrations (MICs) of silver (Ag-NPs) and selenium (Se-NPs) nanoparticles, both alone and in combination with antifungal agents fluconazole (FLU), itraconazole (ITR), and amphotericin B (AMB) on resistant C. parapsilosis strains. Methods: Eight C. parapsilosis strains resistant to antifungal agents (FLU, ITR, AMB) and the standard strain of C. parapsilosis (ATCC 22019) as a control were used in this study. The standard protocol of antifungal susceptibility testing for yeast was performed by the broth micro-dilution method described in the clinical and laboratory standards institute (CLSI) guidelines, document M 27-S4. Results and Conclusions: MICs of standard and resistant strains were different against nano compounds, both alone and in combination with antifungal drugs. The growth of yeast was inhibited by Ag-NPs at concentrations as low as 2 µg /mL (against FLCR1 and FLCR3) and 0.25 µg /mL (against ITRR2 and AMBR2). Antifungal activity testing of Se-NPs revealed that it can inhibit the growth of yeasts at concentrations as low as 4 µg /mL (against FLCR1 and FLCR3) and 0.5 mg/mL (against ITRR2, ITRR3 and AMBR1). The results demonstrated that Se-NPs had lower activity than Ag-NPs, but both (Se-NPs and Ag-NPs) had higher activity than common antifungal agents. Further in vitro and in vivo studies are required for this. Microorganisms, such as yeasts and molds, are often pathogenic in our living environments and cause severe infections in human. In recent years, the rate of candidiasis has increased. Candida species (sp) is a common human pathogen responsible for fungal infections (1, 2). Candida parapsilosis has been characterized as the second- or third-most common yeast species isolated from patients with catheter-associated candidemia, neonates, and patients with bloodstream infections in Latin America, Europe, and Asia (3). In Iran, the prevalence of C. parapsilosis is 38% with candidemia, 17.2% with onychomycosis, and 0.6% with vulvovaginal candidiasis (4-6). Currently triazoles, polyenes, and echinocandins are the available antifungal agents effective against C. parapsilosis. However, administration of these agents is often accompanied by several complications, such as resistance of yeast strain to antifungal therapy resulting in therapeutic failure (7, 8). Thus, the search for new antifungals and alternatives is essential to fight emerging resistant strains of fungal pathogens. Use of metallic or non-metallic nanoparticles (NPs) and herbal extracts in health products are popular now for their antibiotic properties (9-12). Nano metal particles such as silver (Ag-NPs), selenium (Se-NPs) and gold have drawn the attention of scientists due to their broad application in new technologies in medicine (13). Se-NPs have been reported to show low toxicity and high activity. Silver (Ag+) is microbicidal at low concentrations and is used to treat burns, ulcers, and wounds (14). The aim of this study is to investigate the antifungal activity of Ag-NPs and Se-NPs alone and in combination with fluconazole (FLU), itraconazole (ITR), and amphotericin B (AMB), against resistant C. parapsilosis strains. A total of eight resistant Candida parapsilosis strains were obtained from a collection of clinical isolates recovered during an epidemiological study of antifungal resistance conducted at medical mycology department in the Tehran University of Medical Science, Iran (15). These strains were isolated from the nails of eight children. All the children in this study were immune competent (15). In addition, the isolate C. parapsilosis (ATCC 22019) was obtained from the American type culture collection (ATCC) (Manassas, VA, U.S.A.) and used as a control strain. Antifungal susceptibility tests were performed by the broth microdilution method described in clinical and laboratory standards institute (CLSI) guidelines, in the document M27-S4 (16). Two amphotericin B-resistant (AMBR1, AMBR2), three fluconazole-resistant (FLCR1, FLCR2, and FLCR3), and three itraconazole-resistant isolates (ITCR1, ITCR2, and ITCR3) were included in the group of the resistant strains (15). The broth microdilution minimum inhibitory concentrations (MICs) were ≥ 1 µg/mL for AMB and ITC and ≥ 8 µg/mL for FLC (17). The resistant isolates were grown on Sabouraud Dextrose Agar (SDA) medium (Sigma, USA). After 24 hours incubation at 35°C, eight C. parapsilosis colonies growing in SDA medium were suspended in 5 mL of normal saline. After 10 seconds of vortexing, final yeast suspensions were prepared in RPMI 1640 medium (Sigma, USA) and the concentration was adjusted to give a final inoculum concentration of about 0.5 × 103 to 2.5 × 103 cfu/ mL (17, 18). Biosynthesis of selenium nanoparticles was conducted using a method recently described by Fesharaki et al. In brief, cultures of Klebsiella pneumoniae were grown in tryptic soy broth medium (TSB) (Sigma, USA) as seed. TSB was supplemented with 200 mg/l Se+4 and inoculated with 1% Klebsiella pneumoniae seed culture. The culture flasks were incubated at 37°C for 24 hours. K. pneumoniae cells containing red selenium particles were disrupted by autoclaving at 121°C for 20 minutes. The released Se-NPs were centrifuged and washed with distilled water. The washed samples were sonicated for 10 minutes (Techno- Gaz, Tecna 6) and the properties (physical and chemical) of the samples were studied (19). For silver nanoparticles preparation, briefly, K. pneumoniae was inoculated in Muller Hinton broth medium (Sigma, USA) for preparation of Ag-NP stock solution (100 µg/mL), then incubated at 37°C for 24 hours, and centrifuged. Then 1 mL of supernatant was added to 100 mL of silver nitrate (AgNO3, 1 mM). Change of color to a light brown indicates the presence of Ag-NP (18). Microdilution plates (96 U-shaped wells, Roskilde, Denmark) were used for this purpose. First, 100 µL each of RPMI and Ag-NPs stock solution (8 µg/mL) was added to the first well. After turning it up and down, 100 µL of the first well was infused to the second well and carried on until the eighth well. The solution in the eighth well was adjusted to give a final concentration of about 0.0312 µg/mL of Ag-NPs stock solution. The ninth well was the positive control, consisting of RPMI and fungi suspension. The 10th well, the negative control, had only RPMI. Finally, 100 µL of yeast suspension was added to each well except the negative control, and incubated at 35°C for 48 hours. Then the MICs were determined. A similar protocol was followed for preparation of the serial dilution of Se-NPs. The MIC of nano compounds was calculated in combination with antifungal agents (Table 1). Abbreviations: AMB, Amphotericin B; FLU, Fluconazole; ITR, Itraconazole. For the preparation of fluconazole in combination with Ag-NPs, stock solution FLC (128 µg/mL) was diluted with an RPMI medium solution to a final concentration of 4 µg/mL, and an Ag-NPs stock solution (100 µg/mL) was diluted with distilled water to a final concentration of 1 µg/mL. Then 100 µL of yeast suspension was added to each well and incubated at 35°C for 48 hours. By a two-fold serial dilution of test compounds, following a microdilution in the standard CLSI method, the MIC values were determined finally (17). After 48 hours of incubation at 35°C, the MICs were defined as the lowest concentrations that prevented 90% of the growth compared to the growth in control culture. All tests were performed in duplicate. The interpretative criteria for resistance to antifungals were published by the CLSI (17). To determine the combined effect, each well in which the MIC was defined for FLU, ITC, and AMB was treated with various concentrations of Ag-NPs and Se-NPs. Different serial dilutions of FLC (stock concentration 128 µg/mL) were used on standard isolate of C. parapsilosis, and three other resistant strains. MIC for the standard strain was determined to be 4 µg/mL against FLU. The standard strain could grow on 0.125 µg/mL, 0.25 µg/mL, and 0.5 µg/mL of Ag-Np, but was inhibited at 1 µg /mL concentration. It also was inhibited by 2 µg/mL of Se-Np (Figure 1). The results of the antifungal activity test visibly showed that the growth of yeasts is inhibited at concentrations as low as 2 µg /mL (against FLCR1 and FLCR3) and 0.25 µg /mL (against ITRR2 and AMBR2) Ag-NPs. Antifungal activity of Se-NPs revealed that the growth of yeast is inhibited at concentrations as low as 4 µg /mL (against FLCR1 and FLCR3) and 0.5 mg/mL (against ITRR2, ITRR3 and AMBR1). The MIC for the standard strain was determined to be 0.5 µg/mL against ITR and AMB. Table 2 represent the results of MIC of resistant C. parapsilosis in presence of AgNP, SeNP and nano compound in combination with FLU, ITR, AMB. Fungal infections are more frequent in patients who are immunocompromised. The emergence of resistant strains due to prophylaxis with a limited number of effective antifungals is concerning. Therefore, new antifungals are an unavoidable and critical medical need (20). The main aim of this study is the survey of antifungal activity of two nanoparticles against the resistant clinical isolates of C. parapsilosis. Based on the comparison of MICs of both Ag-NPs and Se-NPs with MICs of the selected clinically available antifungal agents, Ag-NPs showed better effects. Pure Ag-NPs showed antifungal effects at concentrations below 2 µg/mL, six-fold higher than FLC. The synergistic effect of the Ag-NPs and FLC showed 24-fold more antifungal activity than FLC alone. The synergistic effect of ITC and AMB with the Ag-NPs showed an activity equal to 29- and 26-fold more than ITC and AMB respectively, based on the geometric mean. According to the current study, antifungal agents with even an insignificant amount of Se-NPs reveal higher antifungal activity against resistant C. parapsilosis compared to the antifungal agents or Se-NPs alone. The Se-NPs inhibit the growth of these resistant fungi at very low concentrations. Current results represent a new approach for the development of the antifungal substances based on the silver and selenium compounds. The results show that the Ag-NPs had more activity than Se-NPs. Clinical prescription of nanoparticles needs more clinical trial reports (1). To the best of our knowledge, it is the first report of an in vitro antifungal activity of Ag-NP and Se-NP compounds against resistant clinical isolates of C. parapsilosis that was performed following CLSI guidelines (M27-S4). Alimehr et al. (18) compared the activity of Ag-NPs and fluconazole on fluconazole-resistant C. albicans strains following the CLSI (M27-A3) protocol. Their findings revealed that Ag-NP inhibited 100% of the fluconazole-resistant C. albicans growth in 1 - 2 µg/mL of concentrations. MIC range of fluconazole-resistant C. albicans was 0.0313 µg/mL - 0.5 µg/mL Ag-NP combined with 8 µg/mL fluconazole, which was close to the results achieved in the present study (MIC range = 0.25 - 1). The difference could be caused by the behavioral discrepancy among Candida species and protocols that had been used in the two studies. Falahati et al. (21) reported 50% of C. albicans isolated from patients had MIC ≤ 0.5 µg/mL when Ag-NP combined with fluconazole was used. They argued that suitable diagnosis of infection in the laboratory, using in vitro susceptibility tests and administration of topical formulations of Ag-NPs in combination with current drugs can be useful for treating vaginal candidiasis and preventing recurrence of the disease. Nasrollahi et al. (22) demonstrated that Ag-NPs exhibited a potent antifungal activity toward C. albicans as a model yeast strain, comparable to the MIC values of Amphotericin B and Fluconazole. Wady et al. (23) reported that the Ag-NP solution exhibited remarkable antifungal activity against C. glabrata and C. tropicalis, associated with several systemic and oral diseases. Gajbhiye et al. (24) showed in vitro antifungal activity of fluconazole with Ag-NPs (as determined by the disk diffusion method). The diameters of inhibition zones for C. albicans were measured and then the fold increase in the area was determined. The antifungal activity of fluconazole enhanced considerably in the presence of Ag-NPs. However, the method applied for the evaluation of antifungal activity in this study does not correspond correctly with our methods. Therefore, the results published by Gajbhiye et al. can be used only as a comparison of the antifungal activity of Ag-NPs against yeasts. Gao et al. (25) reported that antifungal activity of Ag-NPs was significantly better than fluconazole against ocular pathogenic fungi (Fusarium sp, Aspergillus sp, and Alternaria alternata) in vitro. Ge et al. (26) presented that nanosilver is an effective antifungal agent against a wide spectrum of fungi. Our findings indicate that nanoparticles have antifungal activity against resistant isolates. Onychomycosis is a clinical fungal infection, treatment of which can be difficult with current antifungals. Double-blind randomized clinical trials are further suggested based on the results of this study, to confirm the efficacy of these agents in routine practice. This study was supported by school of public health, Tehran University of medical sciences, Grant Number 26956, Tehran (Iran). Authors’ Contribution: Ensieh Lotfali, study concept and design, acquisition of data, and drafting the manuscript. Sassan Rezaie, study concept and design, acquisition of data, study and technical supervision. Ahmad Reza Shahverdi, material support (Nanoparticles preparation). Rasoul Mohammadi, Obtaining fungal isolates. Fatemeh Noorbakhsh, technical support and interpretation. Ali Ghajari and Saham Ansari critical revision of the manuscript. 1. Panacek A, Kolar M, Vecerova R, Prucek R, Soukupova J, Krystof V, et al. Antifungal activity of silver nanoparticles against Candida spp. Biomaterials. 2009;30(31):6333-40. doi: 10.1016/j.biomaterials.2009.07.065. [PubMed: 19698988]. 2. Peterson T. Treatment and prevention of fungal infection. focus on candidemia. NewYork: applied clinical education; 2007. 3. Tay ST, Na SL, Chong J. Molecular differentiation and antifungal susceptibilities of Candida parapsilosis isolated from patients with bloodstream infections. J Med Microbiol. 2009;58(Pt 2):185-91. doi: 10.1099/jmm.0.004242-0. [PubMed: 19141735]. 4. Lotfi N, Shokohi T, Nouranibaladezaei SZ, Nasrolahi Omran A, Kondori N. High Recovery Rate of Non-albicans Candida Species Isolated From Burn Patients With Candidemia in Iran. Jundishapur J Microbiol. 2015;8(10). e22929. doi: 10.5812/jjm.22929. [PubMed: 26587207]. 5. Aghamirian MR, Ghiasian SA. Onychomycosis in Iran: epidemiology, causative agents and clinical features. Nihon Ishinkin Gakkai Zasshi. 2010;51(1):23-9. doi: 10.3314/jjmm.51.23. [PubMed: 20185868]. 6. Mahmoudi Rad M, Zafarghandi S, Abbasabadi B, Tavallaee M. The epidemiology of Candida species associated with vulvovaginal candidiasis in an Iranian patient population. Eur J Obstet Gynecol Reprod Biol. 2011;155(2):199-203. doi: 10.1016/j.ejogrb.2010.11.022. [PubMed: 21194828]. 7. White TC, Holleman S, Dy F, Mirels LF, Stevens DA. Resistance mechanisms in clinical isolates of Candida albicans. Antimicrob Agents Chemother. 2002;46(6):1704-13. doi: 10.1128/AAC.46.6.1704-1713.2002. [PubMed: 12019079]. 8. Dunkel N, Liu TT, Barker KS, Homayouni R, Morschhauser J, Rogers PD. A gain-of-function mutation in the transcription factor Upc2p causes upregulation of ergosterol biosynthesis genes and increased fluconazole resistance in a clinical Candida albicans isolate. Eukaryot Cell. 2008;7(7):1180-90. doi: 10.1128/EC.00103-08. [PubMed: 18487346]. 9. Kazempour ZB, Yazdi MH, Rafii F, Shahverdi AR. Sub-inhibitory concentration of biogenic selenium nanoparticles lacks post antifungal effect for Aspergillus niger and Candida albicans and stimulates the growth of Aspergillus niger. Iran J Microbiol. 2013;5(1):81-5. [PubMed: 23466957]. 10. Lipovsky A, Nitzan Y, Gedanken A, Lubart R. Antifungal activity of ZnO nanoparticles--the role of ROS mediated cell injury. Nanotechnology. 2011;22(10):105101. doi: 10.1088/0957-4484/22/10/105101. [PubMed: 21289395]. 11. Paulo CS, Vidal M, Ferreira LS. Antifungal nanoparticles and surfaces. Biomacromolecules. 2010;11(10):2810-7. doi: 10.1021/bm100893r. [PubMed: 20845938]. 12. Fallh F, Eslami G, Komali H, Houshmand A. Grapefruit alcoholic seed extract effect on Candida albicans resistant to fluconazole and clotrimazole. Int J Nutr Metab. 2010;2(3):56-9. 13. Noorbakhsh F, Rezaie S, Shahverdi AR. Antifungal effects of silver nanoparticle alone and with combination of antifungal drug on dermatophyte pathogen Trichophyton rubrum. International Conference on Bioscience, Biochemistry and Bioinformatics. Singapore. 2011. 14. Silver S. Bacterial silver resistance: molecular biology and uses and misuses of silver compounds. FEMS Microbiol Rev. 2003;27(2-3):341-53. doi: 10.1016/S0168-6445(03)00047-0. [PubMed: 12829274]. 15. Lotfali E, Kordbacheh P, Mirhendi H, Zaini F, Ghajari A, Mohammadi R, et al. Antifungal Susceptibility Analysis of Clinical Isolates of Candida parapsilosis in Iran. Iran J Public Health. 2016;45(3):322-8. [PubMed: 27141494]. 16. Wayne P. Clinical and laboratory standards institute. Implementation Guide of POCT for health care providers. 2007. p. 1-37. 17. Fothergill AW, Sutton DA, McCarthy DI, Wiederhold NP. Impact of new antifungal breakpoints on antifungal resistance in Candida species. J Clin Microbiol. 2014;52(3):994-7. doi: 10.1128/JCM.03044-13. [PubMed: 24403302]. 18. Alimehr S, Shekari Ebrahim Abad H, Shahverdi AR, Hashemi J, Zomorodian K, Moazeni M, et al. Comparison of difference between fluconazole and silver nanoparticles in antimicrobial effect on fluconazole-resistant candida albicans strains. Arch Pediatr Infect Dis. 2015;3(2). doi: 10.5812/pedinfect.21481. 19. Fesharaki PJ, Nazari P, Shakibaie M, Rezaie S, Banoee M, Abdollahi M, et al. Biosynthesis of selenium nanoparticles using Klebsiella pneumoniae and their recovery by a simple sterilization process. Braz J Microbiol. 2010;41(2):461-6. doi: 10.1590/S1517-838220100002000028. [PubMed: 24031517]. 20. Kim KJ, Sung WS, Moon SK, Choi JS, Kim JG, Lee DG. Antifungal effect of silver nanoparticles on dermatophytes. J Microbiol Biotechnol. 2008;18(8):1482-4. [PubMed: 18756112]. 21. 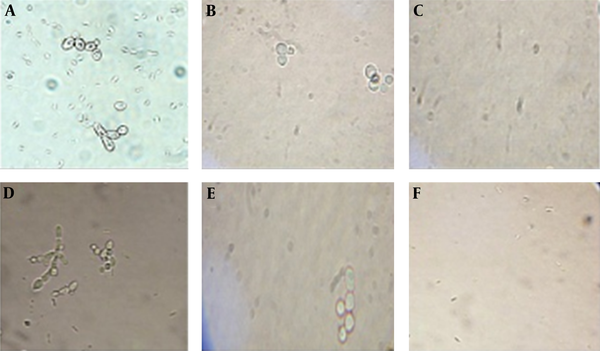 Falahati M, Nozari S, Makhdoomi A, Ghasemi Z, Nami S, Assadi M. Comparison of antifungal effect of nanosilver particles alone and in combination with current drugs on candida species isolated from women with recurrent vulvovaginal candidiasis. Eur J Exp Biol. 2014;4(1):77-82. 22. Nasrollahi A, Pourshamsian K, Mansourkiaee P. Antifungal activity of silver nanoparticles on some of fungi. Int J Nano Dimens. 2011;1(3):233-9. 23. Wady AF, Machado AL, Foggi CC, Zamperini CA, Zucolotto V, Moffa EB, et al. Effect of a silver nanoparticles solution onstaphylococcus aureusand Candida spp. J Nanomater. 2014;2014:1-7. doi: 10.1155/2014/545279. 24. Gajbhiye M, Kesharwani J, Ingle A, Gade A, Rai M. Fungus-mediated synthesis of silver nanoparticles and their activity against pathogenic fungi in combination with fluconazole. Nanomedicine. 2009;5(4):382-6. doi: 10.1016/j.nano.2009.06.005. [PubMed: 19616127]. 25. Gao C, Xu Y, Xu C. In vitro activity of nano-silver against ocular pathogenic fungi. Life Sci J. 2012;9(4):750-3. 26. Ge L, Li Q, Wang M, Ouyang J, Li X, Xing MM. Nanosilver particles in medical applications: synthesis, performance, and toxicity. Int J Nanomedicine. 2014;9:2399-407. doi: 10.2147/IJN.S55015. [PubMed: 24876773].